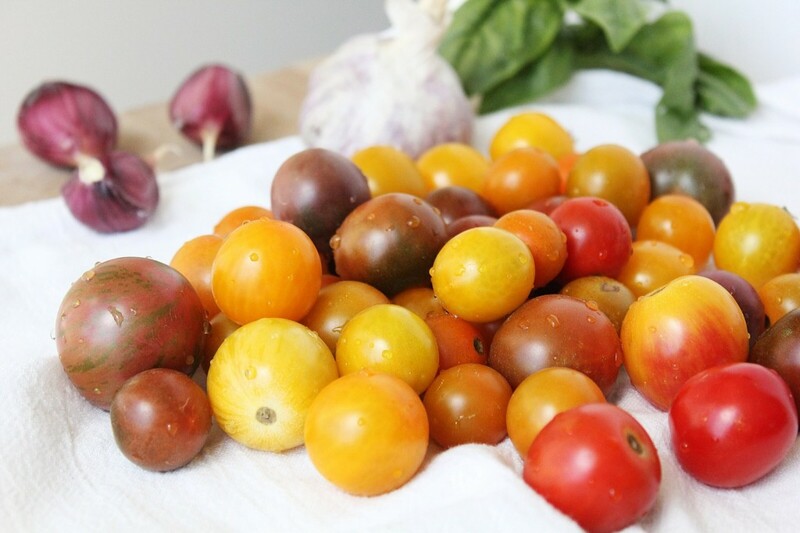 When they’re in season, tomatoes rarely make it into a salad at my house, let alone into more complicated recipes. They taste so good, they disappear from the counter before I can count on them for dinner or any other future concept. I actually had to buy these tomatoes twice before I was able to make this recipe, I kept turning around and they were gone. You might have the same problem at your house, making this recipe a challenge for you. Or maybe you are among the tomato-wealthy who don’t know what to do with all of the tomatoes growing in their garden (can we be friends? I’ll make you stuff). My sister has been growing the most delicious tomatoes this year and I’ve found myself hiding the ones that she’s been sharing with us from my husband, the tomato-processing machine, so that they last more than 15 minutes (I don’t feel bad, I’m extending the pleasure). This recipe was inspired by all of the green tomatoes hanging in her tomato jungle, getting ready to ripen and overwhelm her (they will, right JJ?). Did you know you could ferment them? Fermenting tomatoes does several things; it preserves them so that they will last longer (in your fridge, once fermented), a way of saving those summer-y flavours for later. It ‘pickles’ them –they will taste briny and acidic, which balances out their natural sweetness. They will take on a lightly cooked texture while leaving them totally raw. The fermenting process also gives them beneficial bacteria that aids in our digestive health (tomato probiotics right from the garden!). 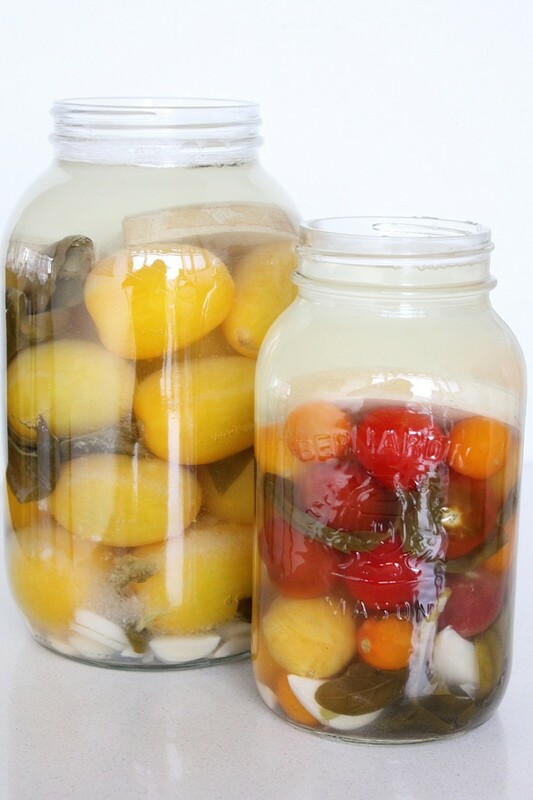 I have talked a lot about fermentation on this blog. I find it is the most effective and affordable way to get living probiotics into our diet. 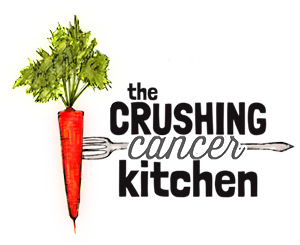 For more tips and recipes check here or here, or click the fermented button on the sidebar to see them all. The most important thing to know when fermenting tomatoes and most veggies/fruit (besides not forgetting about them) is keeping all of the ingredients totally submerged under the brine. I have special mason jar weights that work really well, but you could easily us a cabbage leaf blanketed over the top (and then submerged, itself) or any non-metal makeshift weight. If you use larger tomatoes, you may be able to wedge them in well enough that they don’t float. Check every day, their texture will change which means they could shift, even when you think you have them in there tight. 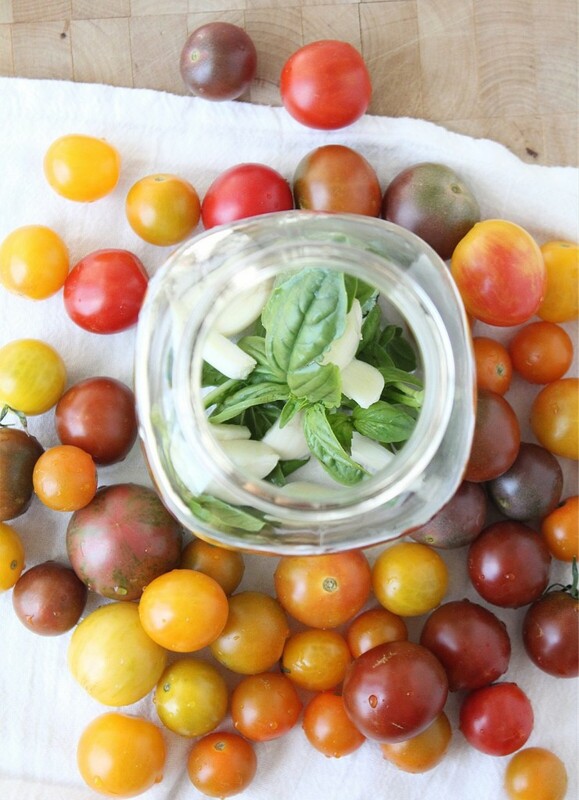 You can use any size tomatoes for this, just make sure to combine the same sized tomatoes in a jar so that they ferment at the same rate. The green basil will turn brown only due to the lactic acid forming in the brine. It will be less pretty but still very good for you. You can mix it up by trying fresh oregano or thyme or whatever you have growing in the garden in place of (or as well as) the basil. If you use cilantro, you could blend up the fermented tomatoes, cilantro and garlic with a bit of the brine to make a flavourful, authentic-tasting salsa that is full of beneficial bacteria. 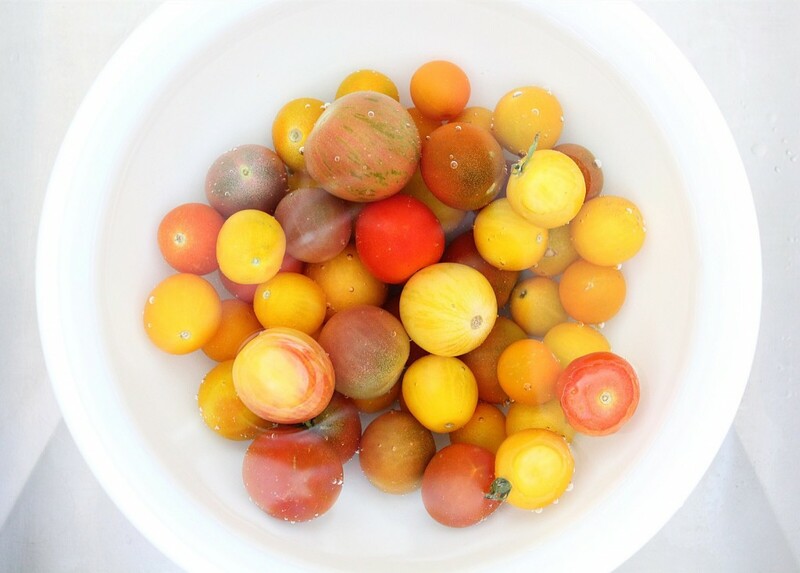 Before we even get to the tomatoes, the brine itself will be infused with the flavours that are fermenting in it. 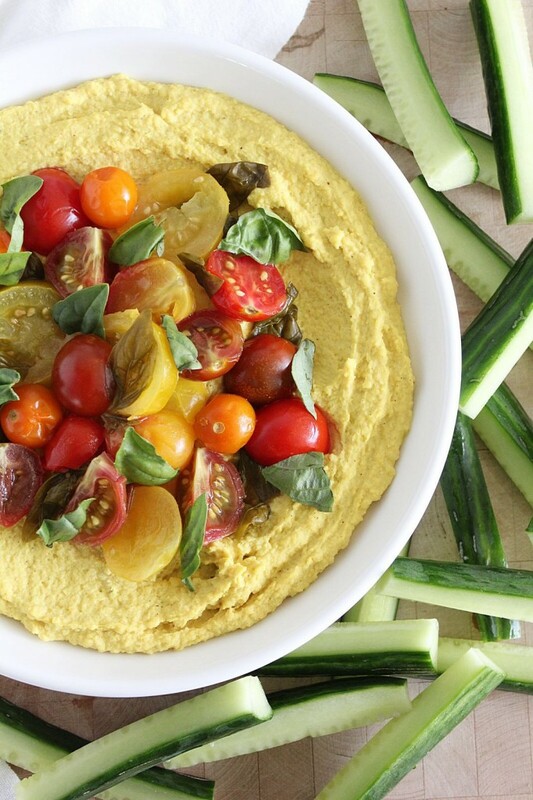 Use it as a water replacement in room temp/cold recipes like the hummus we’ve made here. It would be perfect added to a tomato gazpacho (remember you won’t need extra salt), creamy salad dressings that require water like this one and this one, or even stirred into your soup after you have poured it into your bowl (you don’t want to add it to the boiling pot, it will kill those friendly bacteria). Put these out with some olives before dinner, no one will know they are actually doing their digestion a big favour, they’ll just notice that something delicious has happened to the tomatoes. Blend into or top off your hummus with them, squish them up and add to some warm, cooked beans or zucchini noodles, garnish soup with them or add to any recipe that raw tomatoes would be a good idea in (collard wraps, mashed into guacamole, millet polenta garnish. 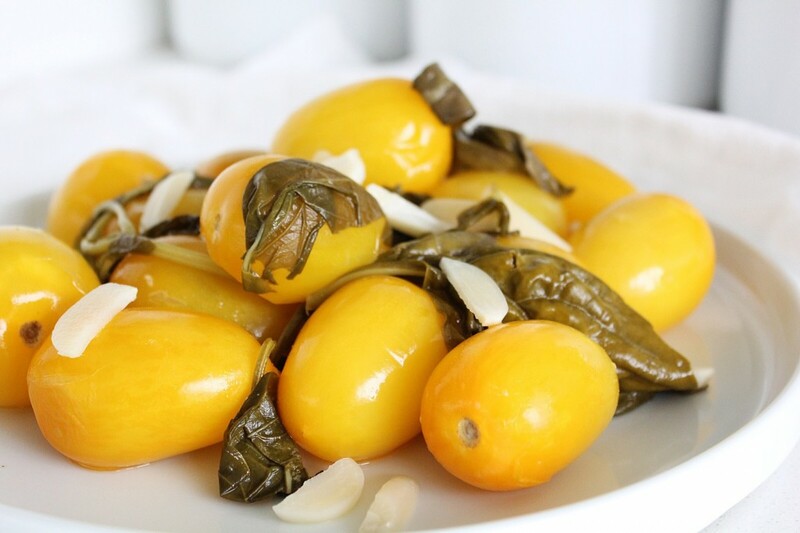 You can also try my current favourite salad dressing, which consists of 3 Tbsp of extra virgin olive oil, 3 Tbsp lemon juice blended together with 2 of these fermented yellow romas (or the roughly equivalent amount of smaller tomatoes) and a bit of the garlic. 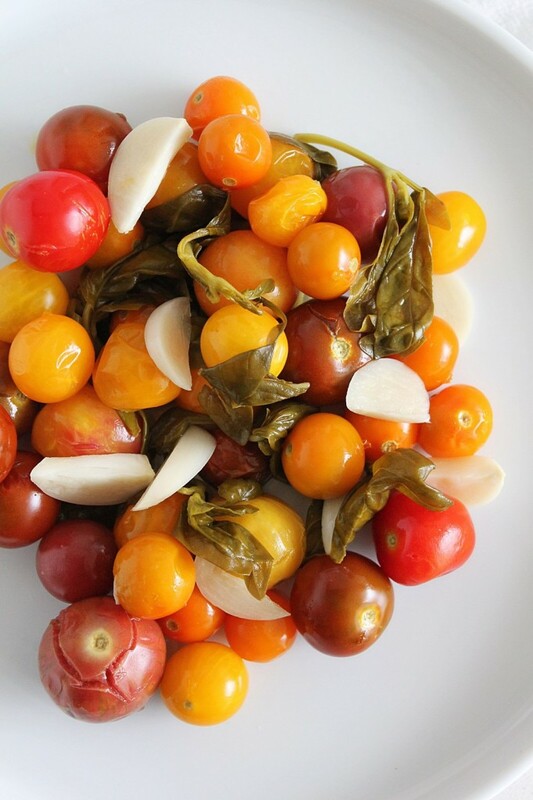 You can toss this with plain lettuce for a surprisingly exciting salad party. Put something on top to weigh them down (non-metal). 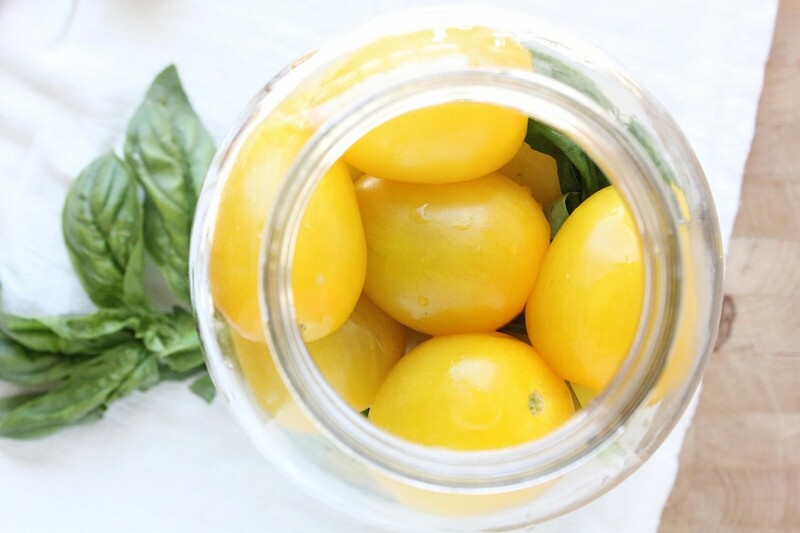 I have mason jar-sized weights but you can also use a clean glass jar filled with water, a clean rock, a cabbage leaf that wraps around the top, or maybe if you're using bigger tomatoes you can wedge them in well enough so that they stay in place. Pour the brine over the top so that it covers the tomatoes by 1-2 inches. Cover with a lid, a tea clean towel and elastic or a fermenting lid. Leave somewhere dark-ish for 5-7 days. Check on them daily to make sure nothing has floated above the surface (if it has, poke it back down and secure it). Taste them at day 4 -they should be sweet and a little acidic and slightly fizzy. Store in the fridge in their brine. 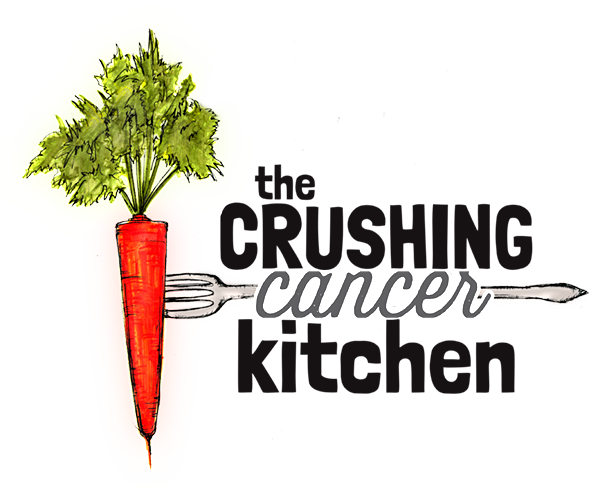 Use the tomatoes, basil and garlic in cooler recipes, cooking them will destroy their beneficial bacteria. Purée them into hummus (use the brine too, in place of water! ), top off your avo toast with them, add them to salad, put them out as appetizers mixed with some olives, put them out on a vegan cheese platter, roughly chop them up to make salsa, eat them right out of the fridge. Whisk the salt and water together to dissolve the salt. OR bring a small amount of the water and all of the salt to a simmer and then turn off. It will dissolve faster this way. Transfer to a cooler container and cool it down further with the rest of the water. Make sure it is closer to room temp before you pour it over the tomatoes. i did try reusing the brine after filtering it. I can say that it did not work. The tomatoes went off rather fermented, i am guessing the brine lost it’s potency and that there was too much residue in the brine even tho’ i filtered it. Now making more with fresh brine! The fizziness is totally fine, it’s a result of the fermentation. As for the brine, some do reuse it, I never have for this recipe because I’m always worried it will get moldy from any residual tomato left in it. I can’t say for sure though, please let me know if you try it! I love this recipe. I made a few jars, in one of the jars the brine became slightly fizzy and so did the tomatoes, they tasted fine. Do you think the fizzyness is ok? 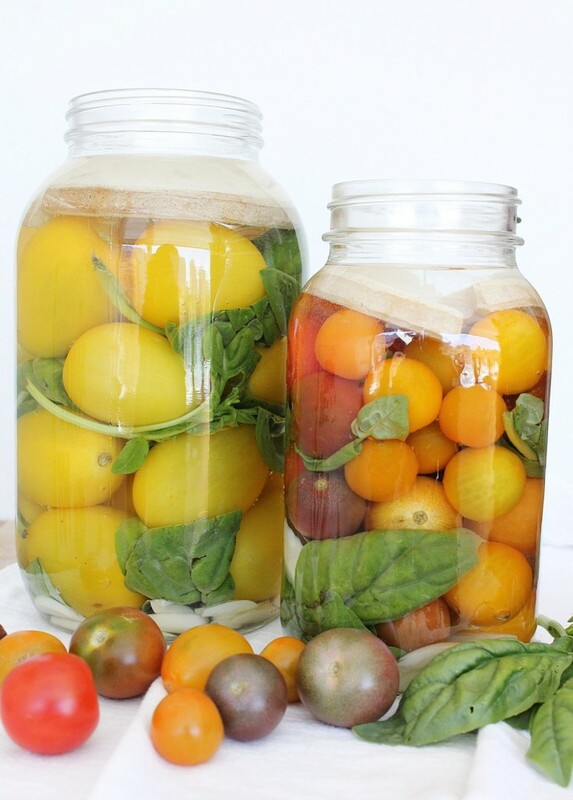 Is it ok to reuse the brine to ferment more tomatoes if i filter out the bits? Do you mean green as in under ripe or green as in heirloom? Either would work in this recipe. If u mean under ripe, they will be more sour so just use them in recipes that need sour ingredients (recipes that use lots of lemon, for example). Guacamole, tabouli salad) they would be good in our veggie paella too! Hi Caroline, there are different opinions about mold on fermented food, but I tend to err on the side of not recommending it for eating (even the stuff below could be contaminated with mold spores). I’m sorry! I’ve totally been there, forgetting about my ferments, and it’s so frustrating. I put their finished date in my calendar now (not that that helps you now). Hi, I’m fairly new to this. I’ve made simple ferments like kimchi and sauerkraut. I made these tomatoes with some leftovers (now wishing I had made several jars). However, I put them in my dark pantry and literally forgot to check them for two weeks. I just pulled them out and the surface of the brine was moldy. The tomatoes look fine. Are they safe to eat? Is the brine safe to use? Good question! The tomatoes will last longer if they are submerged, but they should be waterlogged enough to stay submerged on they’re own. There’s no harm in leaving the weights in though, if u find they’re floating. Love this recipe. Do you need to keep the weights in the jars after the fermentation process is complete. Hi Kacee! As long as you can keep them below the surface of the liquid in a glass/ceramic jar (no metal) they’ll keep for months (just watch for discolouration and sliminess/mold) and don’t forget to use the liquid, it tastes really good (salty though, use it in place of salt). Thanks for the great recipe! About how long do these last in the refrigerator? Haha, probably the easiest too :) Thanks Nadia, let me know if u give them a try! “Fermented button” is the most exotic cultured food I’ve seen so far! Thank you for the beautiful idea! They’ll survive, I’m sure they’re as happy about it as the rest of us. Yes, let’s party! We can use the chilis too. 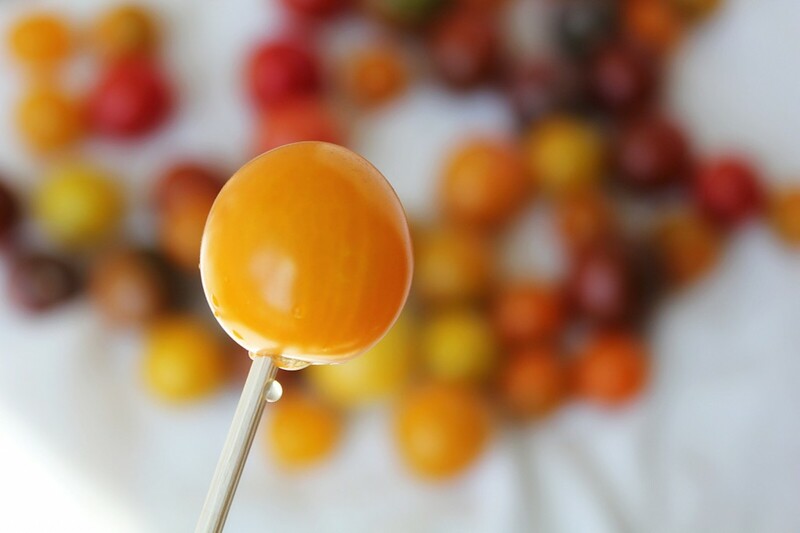 Yesssss…assuming the tomatoes survive this rain, we can have a fermentation party!